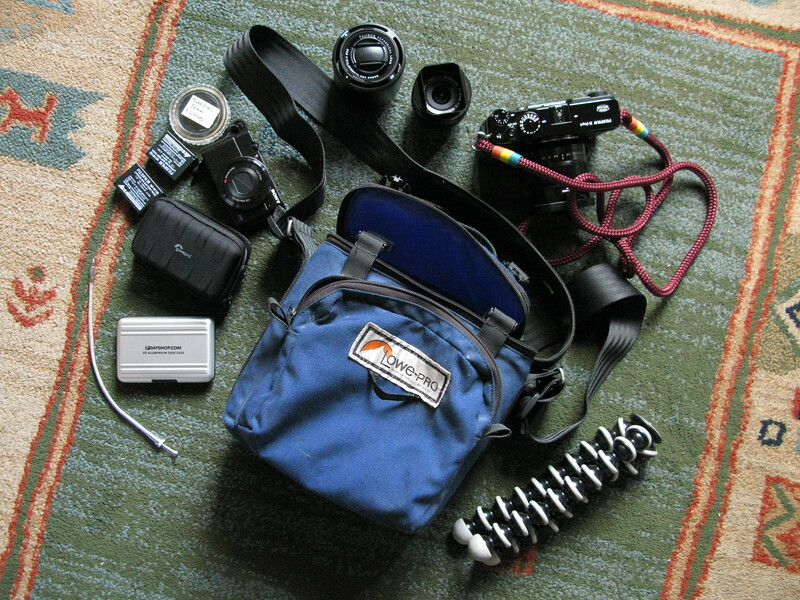 Flickr member Steve J Makin has posted an interesting shot of his current city walk-around camera kit and this is the kind of kit that interests me. 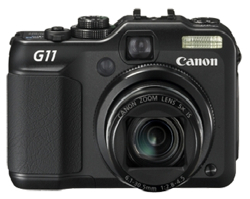 This is not an inexpensive kit but it’s a lot smaller than its DSLR equivalent. There are other pieces to Steve’s kit but they’d be part of any kit. Granted, I used a very high end Canon 35mm lens in the comparison so let’s substitute a cheaper one to even things out (I don’t know the quality of the Fuji lenses parallel to Canon’s line). If you pulled the Sony out and put in a cheaper Canon PowerShot S100 at $363.95 knowing that you’d use the Fuji’s bigger sensor most of the time and why blow an extra $300 on the backup camera the price drops a bit. This is a fascinating study and while there are pieces of it that are subjective (does one like using the Fuji camera?) assuming that both camera systems make excellent images (they do) and one likes using them (many like each) and assuming that Fuji’s lenses are in the same league as Canon’s (I don’t know this but the reviews are good) we have real choices now. And, the Fuji kit is much smaller and lighter. This really appeals to me. There is a lot of talk that the Fuji X-Pro 1 is slow to focus but so are some of Canon’s lenses listed above. There is the issue of few lens choices in the newer Fuji ecosystem but how many choices does one need? A few good zooms and a few good primes and a macro and one is set for everything short of birds and sports. The talk is that a firmware update for the Fuji X-Pro 1 will solve some of its AF problems. We shall see. I have an aging Canon 5D and a few nice lenses left in my collection. Selling that gear could finance much of Steve’s kit above but I’d have to grow fonder of Fuji cameras to want to do this. I do, however, want a smaller, lighter kit for walking around New York and possibly to take on hikes where spending some time shooting wouldn’t get in the way of hiking and what Steve has posted appeals to me a lot. 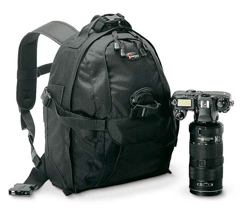 At the time of this posting, B&H Photo has 306 backpacks and daypacks dedicated to holding camera equipment. 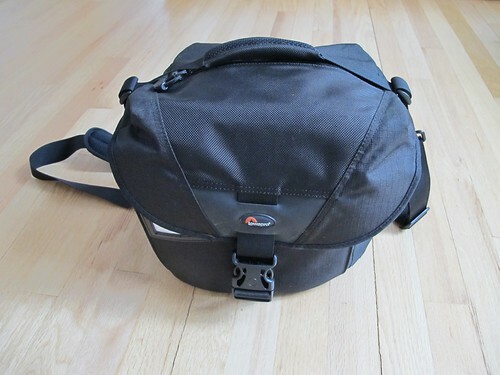 For many years I had and used a Lowepro MiniTrekker AW (pictured here) which is no longer made. Fully loaded with my gear the pack weighed upwards of 20 pounds or more and it was hell to carry around. Also, most packs like these have little provision for carrying the kinds of things one needs on a serious hike: extra clothing, food, water, first aid and more. In other words, they’re made to carry a lot of camera equipment over short distances. 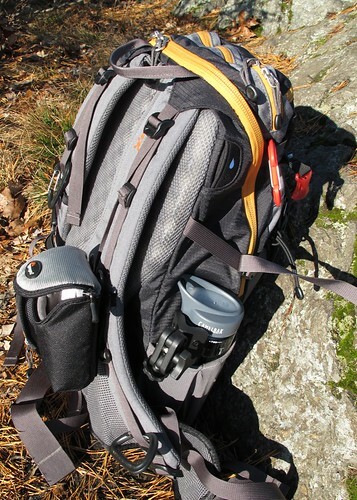 Some are better than others and following the B&H link above will no doubt turn up a lot of packs but few will be useful to hikers doing serious hikes in the wilderness. My solution to this was to simply not carry my big gear, instead carrying a small Canon G11 in a small (Lowepro) pouch on the shoulder strap of my more comfortable hiking pack. I continue to do this and it’s working well for me. Recently, however, I thought it would be fun to bring my bigger gear up to a beaver pond I’ve been hiking to and photographing. It would be great to get a picture of the beaver with a 5D and 300mm lens. 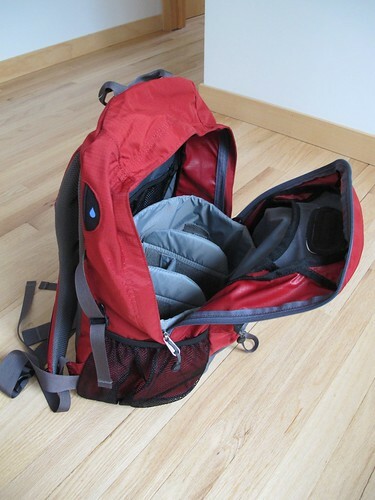 One idea I had was to simply place my Lowepro Stealth Reporter 200shoulder bag inside my hiking pack. 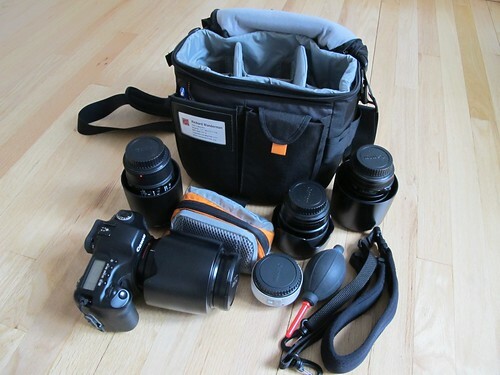 This would leave room for extra clothing and food and rain gear and afford the camera gear protection. 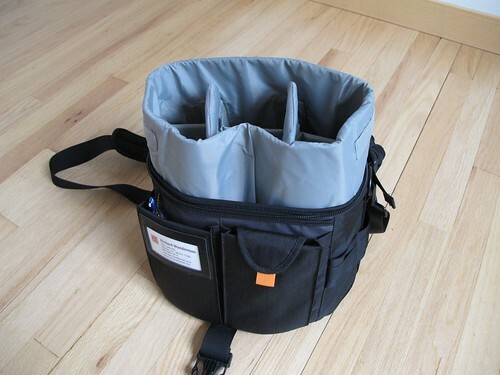 However, this is where a great feature of the particular shoulder bag I have is extremely useful. 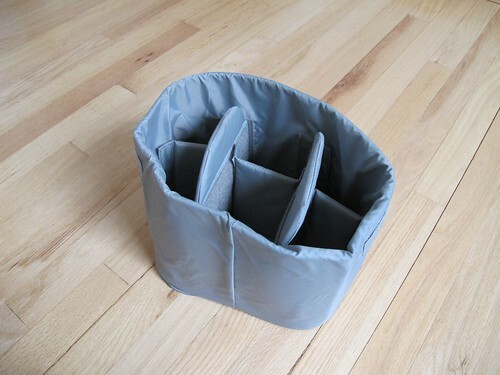 Note, any bag or foam insert can be used for this idea. 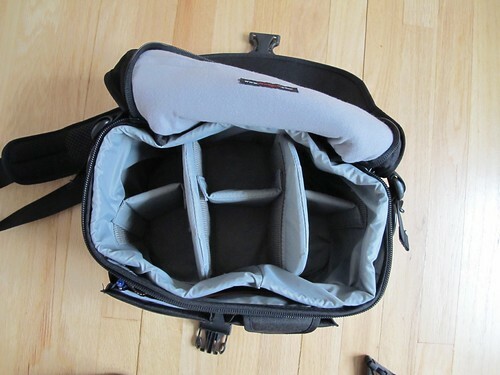 The idea is simple: take the foam insert out of the shoulder bag and place it in the bottom of a hiking pack, allowing safe carrying of camera gear and in addition, carrying all the necessary hiking gear. 1. Take a Lowepro Stealth Reporter 200 shoulder bag and fill it comfortably with the gear you’ll need on the hike. 2. Remove padded foam insert from bag. It’s held in by velcro which is easily ripped apart. 3. 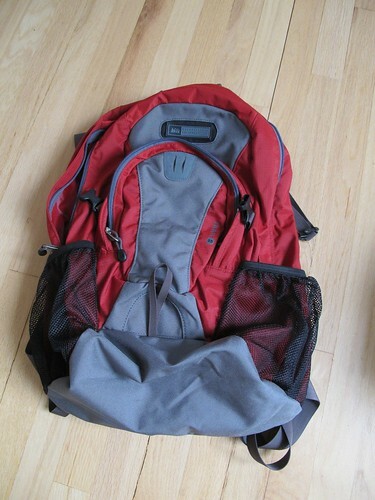 Take any comfortable hiking pack and empty it. Note, the pack needs to be big enough to hold the padded insert. This is an REI Trail 25, about the smallest, cheapest hiking pack that could be used for this. 4. Place foam insert in bottom of pack. 5. 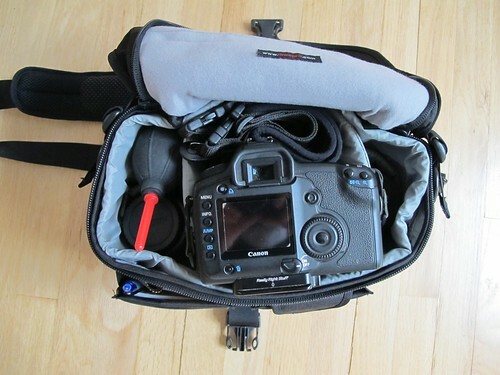 Load insert with camera gear. In this case I’m able to get a Canon 300mm f/4 lens in where I could not get it in the shoulder bag, this setup gives me more headroom for long lenses. 6. 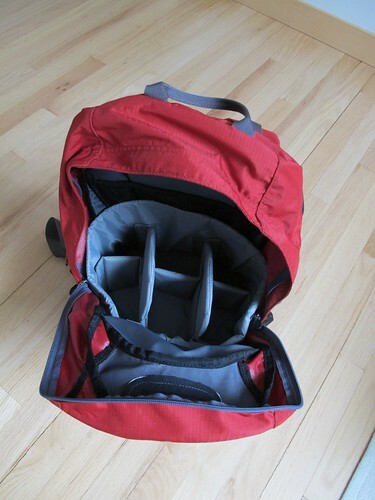 Add more hiking gear on top and close bag. 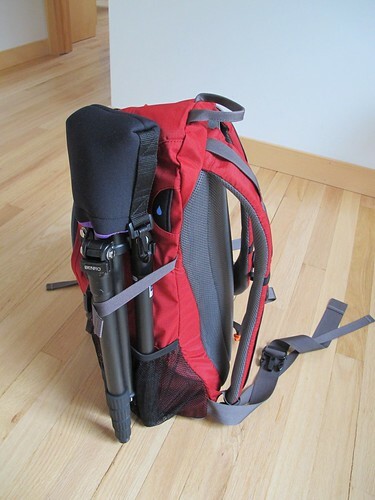 Add small tripod to side, fitting a leg into the water bottle holder. 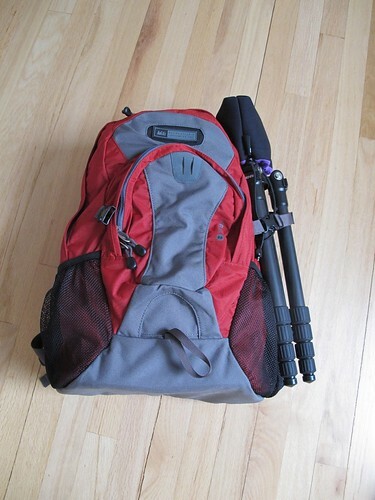 An additional plus to this idea is that this type of pack doesn’t advertise that you’re carrying a camera (if you leave the tripod off the outside). 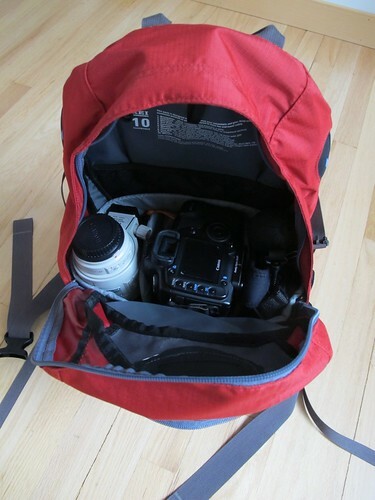 An alternative to this idea is to use lens cases and a camera wrap and place the camera gear in the bag along with all the other hiking gear. That may be best in the long run and I’ll experiment with it as well. I do, however, like the idea of using a regular hiking pack rather than a dedicated camera pack for occasional carrying of larger gear on hikes. If you have experience hiking with a DSLR I’d love to hear about it. In a discussion on flickr on what it takes to be a “great photographer” the conjecture is that one can’t do it with a point and shoot camera. It’s both an immature conjecture and an interesting consideration wrapped up together. An experienced photographer can do more with less. An inexperienced photographer does less with more.